Case study written by Ian Haydock, Library Systems Manager at Keele University. 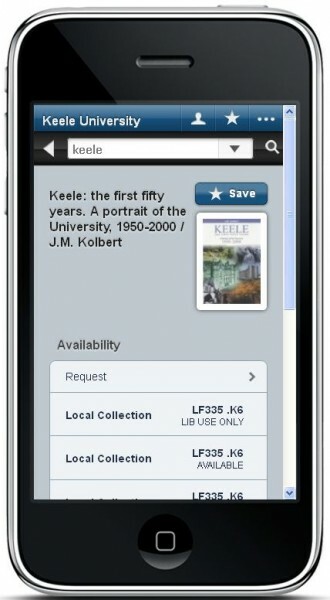 Libraries should be easy to use, but it became clear with the first generation of smartphones that the current library catalogue at Keele University is not ideal for use with small screens. It is optimised for a PC monitor, and thus requires some familiarity with its design to be used effectively on a smaller device. Users were coming to the Helpdesk reporting problems caused by their not recognising the need to scroll across or downwards. Perhaps in an ideal world the OPAC design would elegantly degrade according to screen capability, but this capability is not available at the moment. A hosted system from a 3rd party provider such as Library Anywhere or Boopsie. An open-source solution developed and maintained largely in-house using modified html and css pages. Keele University Library is a long-standing customer of LibraryThing’s catalogue enhancements so it was decided to trial their system Library Anywhere. They describe the system as working via “sophisticated screen scraping”, with no requirements for z39.50 or firewall changes. No installation is needed: the library supplies details of their OPAC to LibraryThing and they do the rest, sending a URL for the mobile version of the catalogue in return. Apps are also available for iPhone and Android, as well as the ‘universal’ version for general web use. As a bonus, costs are also substantially less than the equivalent product from our LMS supplier. Local customisation is rather more limited in terms of ‘look and feel’ than the other alternatives, but of course the space to do this is limited on a smartphone screen. Options for links to library news, events, etc. are however available. Usage statistics are provided on a password-protected webpage and can be downloaded in .csv format for further evaluation. The system was tested on iPhone, Android and Symbian smartphones and found to be easy to use, quick and effective. The lack of substantial local customisation was outweighed for us by the flexibility of a subscription-based service: if the former was needed in future it would be easy to end the subscription and move on to another system (although at the moment we see no reason to do so). After only 3 months from launch it is still early days, but so far Library Anywhere has been one of our easier systems to manage, with no downtime (that I am aware of!). We received plenty of positive feedback via the Library blog, and have built on the product to enable QR Codes on the normal catalogue (when these are scanned the smartphone is directed to the appropriate page on the mobile catalogue instead, making it easier for the users to locate material). Library staff report having seen the mobile catalogue in use within the library, and the helpdesk has received fewer enquiries from users trying to use the catalogue on smartphones. To any libraries considering making their catalogue available this way I would say that the gain is (so far) less than the pain!